This airticle is aboot the ceety in Roushie. For the Barnaul meteorite o 1904, see meteorite faw. 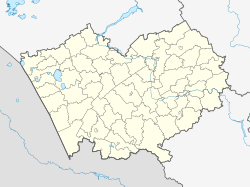 Barnaul (Roushie: Барнаул) is a ceety an the admeenistrative centre o Altai Krai, Roushie, locatit on the Ob River. Population: 612,401 (2010 Census); 600,749 (2002 Census); 601,811 (1989 Census). The ceety lees alang the Ob River in the Wast Siberie Plain. It is the closest major ceety tae the Altai Muntains tae the sooth. Barnaul is situatit relatively close tae the mairch wi the kintras o Kazakhstan, Mongolie, an Cheenae. Barnaul wis ane o the earliest ceeties established in Siberie. Oreeginally chosen for its proximity tae the mineral-rich Altai Muntains an its location on a major river, the steid wis foondit bi the walthy Demidov faimily in the 1730s. In addeetion tae the copper which haed oreeginally attractit the Demidovs, substantial deposits o siller wur suin foond as well. In 1747, the Demidovs' factories wur taken ower bi the Croun, an suin became the major siller centre o Roushie. Bi the 18t an early 19t centuries, 90% o Roushie siller wis producit in the Altai region. Barnaul wis the steid o the kintra's lairgest siller-smeltin factory, an as production expandit, sae did the population. In 1771, the ance-smaw dounset wis grantit toun status, ane o the lairgest in Siberie. Bi the 1900s, Barnaul haed grown intae a major centre o tred an cultur o the region, especially efter the construction o the Turkestan-Siberie Railwey. In 1914, Barnaul wis the steid o a draft riot, Roushie's lairgest durin Warld War I, which resulted in ower a hunder casualties. Awtho the ceety wis thoosans o miles awa frae the actual fechtin, hunders o thoosans o ceetizens frae Altai Krai focht an dee'd at the front in the course o the Seicont Warld War, a fact commemoratit bi a lairge memorial in central Barnaul. The same period saw Barnaul's economic importance increase dramatically as a result o the relocation o major Soviet industrial facilities frae the wast o the kintra tae the safety o distant Siberie. As a result, Barnaul continues tae host ane o the lairgest ammunition factories in Roushie. 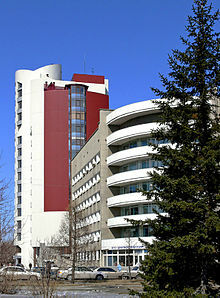 Barnaul is the admeenistrative center o the krai. Athin the framewirk o admeenistrative diveesions, it is, thegither wi ane wirk dounset an twinty-fower landwart localities, incorporatit as the ceety o krai significance o Barnaul—a admeenistrative unit wi the status equal tae that o the destricts. As a municipal diveesion, the ceety o krai significance o Barnaul is incorporatit as Barnaul Urban Okrug. The continental climate o Barnaul (Köppen Dfb) is defined bi its geografical poseetion at the soothren end o the Siberie steppe: it is subject tae lang, frigid winters, wi a average o −15.5 °C (4.1 °F) in Januar, but enjoys a short wairm saison in the simmer wi a average temperatur o +19.9 °C (67.8 °F) in Julie. Temperaturs can vary in the extreme, frae belaw −45 °C (−49 °F) in the winter tae abuin +35 °C (95 °F) in the simmer. The climate is relatively dry. The average precipitation in the aurie is 433 millimeters (17.0 in) per year, 75% o which occurs durin the region's wairmer saison. Barnaul is an important industrial centre o Wastren Siberie. Thare are mair nor 100 industrial enterprises in the ceety, employin approximately 120 thoosan fowk. Leadin industries in the ceety wirk wi diesel an carbon processin; as well as production o hivy machinery, tires, furnitur an fuitwear. It is hame tae a newly established diamond facetin industry, which the ceety howps will expand an acome a major soorce o revenue in the futur. Barnaul is currently ane o the anerly locations in Roushie which haes a industry specializin in diamond-facetin. The main business street o the ceety is Leninsky Prospect, which runs soothwast frae the Ob River throu the centre o the ceety. In recent years, a nummer o new heich-end shoppin centres hae appeared tae meet demand for products desired bi the ceety's nouveau riche. Anither industry quickly chyngin the face o Barnaul's dountoun aurie is the restaurant industry: while choices haed been extremely limitit till recently, a growin nummer o establishments caterin tae fowk o differin income levels are becomin mair common, coincidin wi the upturn in the region's economy. Barnaul haes air, railwey, road an riverboat links tae ither pairts o Roushie. The ceety lees approximately 220 kilometers (140 mi) sooth o Novosibirsk, the lairgest ceety in Siberie an the third-lairgest in Roushie. It is at a junction o the Novosibirsk–Almaty an Biysk train lines. Thare are frequent buses tae nearbi ceeties Biysk an Gorno-Altaysk an aw. It taks aboot fower oors tae reach the Altai Muntains in the sooth bi caur alang the Chuysky heich-gate. Barnaul airport locatit aboot fifteen minutes frae the centre o the ceety, which affers daily flichts tae an frae Moscow an Saunt Petersburg amang ither mair local flichts. Barnaul is approximately fower oors bi plane frae Moscow, an slichtly langer tae Saunt Petersburg. It taks approximately fower oors bi plane tae reach Vladivostok on the Paceefic coast o Roushie an aw. Ony pairt o the ceety can be reached uisin public transport, whether bi bus, trolley, tram or taxi. Awtho Barnaul's main roads hae unnergane recent renovation, maist ither roads are in serious disrepair. Barnaul is a important regional centre o scienteefic development. Five varsities, includin Altai State Technical Varsity, Barnaul State Pedagogical Varsity, Altai State Medical Varrsity, Altai State Agrarian Varsity an Altai State Varsity, as well as 35 librars are locatit in the ceety. 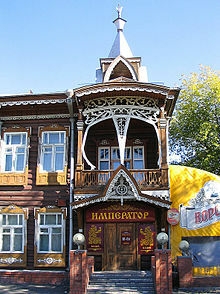 Barnaul haes five theatres an three museums an aw. The ceety's Museum o Local Lear wis foondit in 1823 an is ane o the auldest in Siberie, displayin local airtists' wirk as well as unique airtifacts frae the Altai region. Syne 1957 FC Dynamo Barnaul haes been the ceety's profeesional fitbaa club. The club haes recently advancit frae the Roushie Seicont Diveesion tae the Roushie First Diveesion afore bein relegatit again tae Roushie Seicont Diveesion in 2009. Barnaul's main street as seen frae the new Ob River Brig. ↑ 1.0 1.1 Энциклопедия Города России. Moscow: Большая Российская Энциклопедия. 2003. p. 37. ISBN 5-7107-7399-9. ↑ Почтовые индексы Алтайский край, Город Барнаул. Ruspostindex.ru. Retrieved on 2013-08-20. ↑ How to call Russia: country code, area codes, phone books. Howtocallabroad.com. Retrieved on 2013-08-20. ↑ Sanborn, Josh. "The Mobilization of 1917 and the Question of the Russian Nation." Slavic Review, Vol. 59, No. 2: pp. 267-89. ↑ "Climate Normals for Barnaul". National Oceanic and Atmospheric Administration. Retrieved 23 January 2013. Алтайский краевой Совет народных депутатов. Закон №28-ЗС от 1 марта 2008 г. «Об административно-территориальном устройстве Алтайского края», в ред. Закона №100-ЗС от 25 декабря 2012 г. «О внесении изменений в Закон Алтайского края "Об административно-территориальном устройстве Алтайского края"». Вступил в силу 8 марта 2008 г. Опубликован: "Алтайская правда", №67, 8 марта 2008 г. (Altai Krai Council of People's Deputies. Law #28-ZS of March 1, 2008 On the Administrative-Territorial Structure of Altai Krai, as amended by the Law #100-ZS of December 25, 2012 On Amending the Law of Altai Krai "On the Administrative-Territorial Structure of Altai Krai". Effective as of March 8, 2008.). Алтайское краевое Законодательное Собрание. Закон №144-ЗС от 27 декабря 2008 г. «О статусе и границах муниципального и административно-территориального образования город Барнаул Алтайского края», в ред. Закона №44-ЗС от 2 июля 2009 г «О внесении изменений в Приложение 1 к Закону Алтайского края "О статусе и границах муниципального и административно-территориального образования город Барнаул Алтайского края"». Вступил в силу через 10 дней после дня официального опубликования. Опубликован: "Алтайская правда", №5–6, 15 января 2009 г. (Altai Krai Legislative Assembly. Law #144-ZS of December 27, 2008 On the Status and the Borders of the Municipal and the Administrative-Territorial Formation of the City of Barnaul of Altai Krai, as amended by the Law #44-ZS of July 2, 2009 On Amending Appendix 1 of the Law of Altai Krai "On the Status and the Borders of the Municipal and the Administrative-Territorial Formation of the City of Barnaul of Altai Krai". Effective as of the day which is 10 days after the day of the official publication.). Wikisource haes the text o the 1911 Encyclopædia Britannica airticle Barnaul. This page wis last eeditit on 8 Mairch 2018, at 06:33.